7.5/11 Outboard Prop Shaft Assembly. 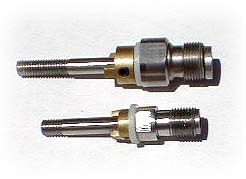 Housing is machined from stainless steel, hardened and ground prop shaft. Bushing and Needle Bearing support shaft. Designed for high-speed and longevity. Fits other "popular" lower drives.